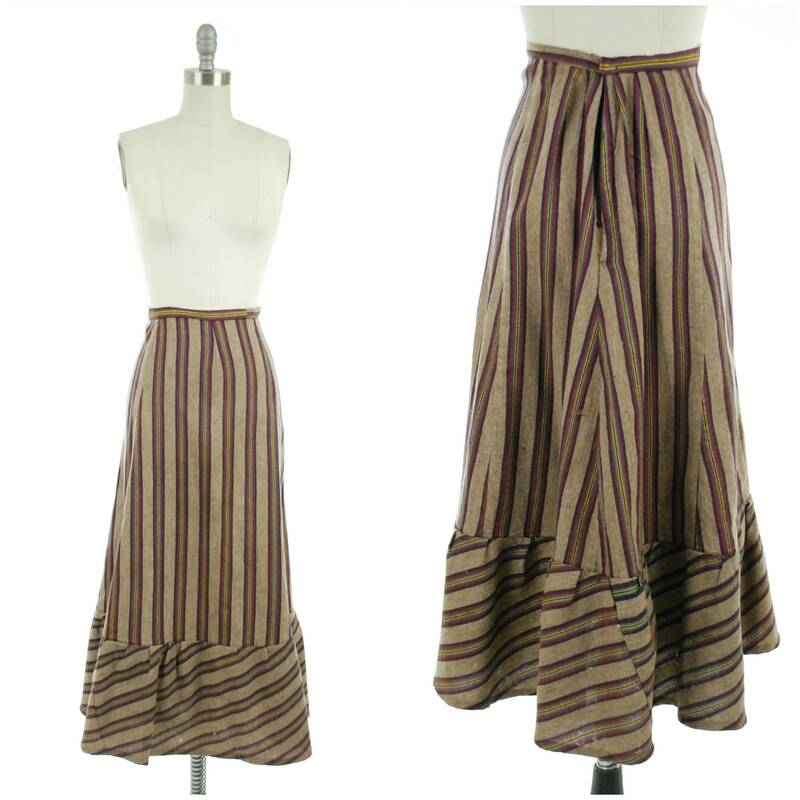 Someone in the 70s recognized the beauty of this woolen skirt from the Edwardian era, and did some minor adjustments, mostly to the closure, to wear it in that era. And it's still an absolutely beauty, but it does have flaws, so please read the condition notes. Heathered brown, with bands of navy, burgundy, bright blue, yellow. There's more fullness to the center back, so this is likely from the s-curve era. A wide band of self-fabric swirls around the hem, lightly ruffled. It closes with a metal zipper at the back. Condition: Fair, but wears beautifully. This skirt is clean and ready to wear. Sadly, the moths had at this. There's scattered holes all throughout the bottom ruffle, and some holes and thin spots through the main body of the skirt. The number is significant, and you can see some of them in close ups. The skirt wears very well, but it is flawed, and meant for someone who wants beauty not perfection and is priced accordingly.